News Items posted on the Chevron Heritage site. Crystal Palace Sprint- Silverstone International Trophy - Brands Hatch Masters - May 2016. Zandvoort Historic Grand Prix August 2015. Monza Classic - Silverstone Int. 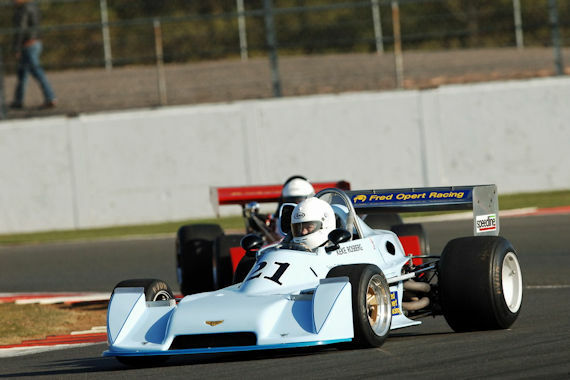 Trophy - Brands Masters - Brands Super Prix Historic - Silverstone Classic - May to July 2015. Catalunya Classic Revival - Barcelona April 2015. Goodwood and Thruxton March/April 2015. Le Mans, Brands Hatch and Silverstone July 2014. Silverstone HSCC Classic, July 2010. Castle Combe HSCC, Augst 2010 (Part 2). Castle Combe HSCC, August 2010. Spa and Le Mans, July 2010. Brands Hatch HSCC July 2010. Monza 58° Coppa Intereuropa Storica and the Vernasca Castel'Arquato Hillclimb. Brands Hatch Masters, May 2010. Silverstone International Trophy, May 2010. RMU Classic Spa, May 2010. Monaco Auctions and Historique GP, May 2010. New Zealand F5000 Tasman Cup Revival Series Rnd 6. New Zealand F5000 Tasman Cup Revival Series Rnd 5. New Zealand F5000 Tasman Cup Revival Series Rnd 4. New Zealand F5000 Tasman Cup Revival Series Rnd 3. New Zealand F5000 Tasman Cup Revival Series Rnd 2. Australian GP support confirmed for second year. New Zealand F5000 Tasman Cup Revival Series Rnd 1. Formula 3 returns to Monaco. Bobby Rahal buys a Chevron Cars Ltd B16. Chevron Drivers reunion at the BRDC. The ex-Keegan B34 restoration is complete. Ex-Keegan B34 restoration almost complete. The Chevron Heritage web site is launched.